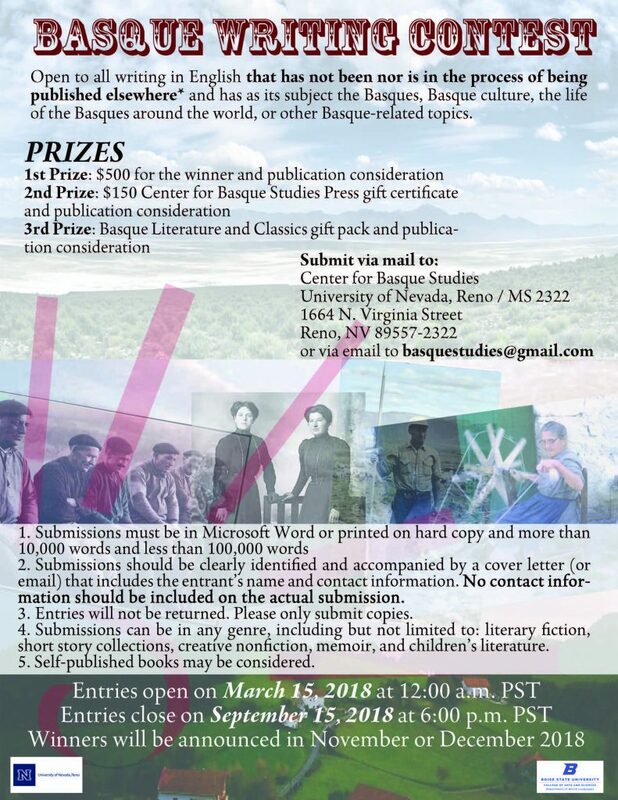 The Basque Writing Contest from Reno’s Center for Basque Studies is open to all writing in English that has not been nor is in the process of being published elsewhere and has as its subject the Basques, Basque culture, the life of the Basques around the world, or other Basque-related topics. Submissions should be clearly identified and accompanied by a cover letter (or email) that includes the entrant’s name and contact information. No contact information should be included on the actual submission. Entries will not be returned. Please only submit copies. Submissions can be in any genre, including but not limited to: literary fiction, short story collections, creative nonfiction, memoir, and children’s literature. Self-published books may be considered. Held in conjunction with the Basque Studies Program at Boise State University.